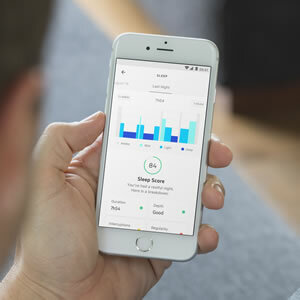 Nokia Sleep (Withings Sleep) is an easy-to-set-up, dedicated sleep tracker that promises to keep an eye on your sleep’s quality all night long. But is it the sleep tracker that you're looking for? As with anything else, the answer depends not only on the product features itself, but also on your priorities and preferences. To have a clear picture of why you would or would not prefer the Nokia Sleep as your next sleep tracker, we will go through all the features one-by-one and dive into the pros and cons of each one. In a hurry? 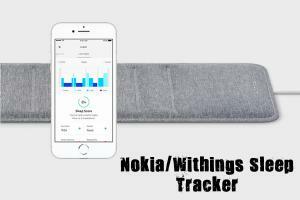 Click here to see the best current price we could find for Nokia(Withings) Sleep. What If Wi-Fi is Gone? What about Using the Tracker for More than One Person on One Bed? Just like Beddit Sleep Tracker, Nokia Sleep comes with a fabric pad sensor about 64cm (25") in length and 5mm (0.2") in thickness. You position the pad horizontally at the chest level between the mattress and the bed platform or between the mattress and mattress topper. After installing the Health Mate app from the App Store or Play Store, you go through the simple steps and plug in the Nokia Sleep using the adapter. The setup instructions will guide you for calibration of the sensor, which takes about 10 minutes, and you should not be using the bed while calibrating. When you hear a buzzing sound from the pad, Nokia Sleep is ready to serve you and track your night's rest. Nokia Sleep setup is easy and straightforward, but you may need to track the data closely for the first couple of days to see if it is recording everything right. If not accurate, play with positioning and placement of the pad, and recalibrate. Try to move the sensor inward toward the middle of bed and re-test if it records correctly. At first setup, Bluetooth is used to connect the Sleep to Health Mate App on your smart-phone. Afterwards, all it needs to function is an active Wi-Fi connection to track your night without you touching any buttons or changing settings. Nokia Sleep also has an internal memory, in case the Wi-Fi you use is not stable or lost during the night. It can record and keep the night's data (only for one night), and transmit the data when the connection is available. Sometimes, you might have to wait a couple of hours for data to be synced to your cell phone, since the sleep data is first transferred to the Withings's server and then back to your phone. If you share your bed with a partner, both of you can track your sleep patterns simultaneously by buying another Nokia Sleep set and placing both under the mattress. Sleep is a solid choice for those who don't want to wear anything on their wrist or for those who are hesitant to keep a cell phone just next to their head in bed. However, full automation comes with its shortcomings. If Nokia Sleep does not record the time you go to bed or leave the bed correctly, you have to find the reason why it is not functioning properly. As I mentioned above, if where you place the pad or the position of the pad in the bed is not good enough for the sensors, then you have to play around with the setup process once more and recalibrate the sleep device. A similar product, Beddit, allows you to either start the sleep monitor manually when you go to sleep or automatically tries to sense that you are in bed for sleeping. One of the complaints about the usage was that if you play games, watch TV, or read a book in bed before going to sleep, the sensor can mismark the beginning of sleep time. If you know at what time you fall asleep at, you can edit your night data to get more accurate sleep score measurement. I think that a manual button to turn on the tracking like Beddit has would be a good option for Nokia Sleep. You could keep the automatic detection on, but when necessary, you could start the monitoring manually. The higher the score means that you had a good night's rest. You can also see a breakdown of the sleep data, like how long you were in bed, the number of times you wake up during the night, and times you fell asleep and woke up. You can also integrate the data from Health Mate sleep app with Apple's and Google's Health Apps and combine sleep data with your health data from other trackers. The app tracks deep, light, REM sleep states of each night and presents them to you in a graphical form. The sleep trackers use the movement and heart rate data to distinguish each phase of cycles. However, keep in mind that you might get different scores for sleep cycles since different sleep monitors have different approaches to measuring light sleep, deep sleep, and REM sleep periods. The pneumatic sensor in Nokia Sleep pad measures the resting heart rate using a method called Ballistocardiography. Ballistocardiography is a method that records the motion of the body caused by heart activity and great vessels. The app gives you an average resting heart rate for the whole night, and you can tap on the Heart Rate to see the details of last night on a new screen. If you are a more data-oriented user who wants more hard numbers and ways to analyse the data from different perspectives, you might be a little disappointed with the app's data reports. For example, why not compare sleep cycles along with heart rate data to have a clear picture of how these two variables correlate with each other and the Sleep Score? I think this is a missing feature in many of the sleep trackers in the market. The pad has a microphone for snore detection. Nokia Sleep captures any audio signals and couples it with respiratory patterns to tell you when and for how long you snored. Nokia Sleep comes with a cool IFTTT integration feature to automate things like turning lights on and off when getting in or out of bed. In its simplest form, IFTTT (if this then that) is a toolkit that lets you connect two or more smart devices and lets them talk to each other. For example, when you get out of bed, you can program the Nokia Sleep to turn on hue light, set a hue scene, or track your data in a Google Spreadsheet. In theory, IFTTT integration is a great feature to improve your room environment if you have compatible smart devices at home. However, there are only 13 applets available, which makes IFTTT usage a little bit restricting. If you have different sleeping hours during the weekdays and the weekend, you may experience something called "Social Jet Lag." Recent studies show that social jet lag may be associated with heart disease, fatigue, insomnia, memory loss or depression. The research indicates that not only the sleep duration but also consistency of sleep timing is critical for supporting optimal health. If you are one of those with inconsistent sleeping patterns on weekdays and weekends, you can enroll in an 8-week coaching program. The program can help you to minimise the adverse effects of social jet lag by assisting you to straighten out your sleep hours. Sleep Smarter program collects your sleep data for three weeks and then provides a graph that shows your Social Jet Lag score during this period. Then, you are invited to the "Sleep Master Challenge" to balance your sleeping habits to a normal range. Smart wake-up is one of the practically helpful features of most sleep monitors, but unfortunately, not even a basic alarm is part of Nokia Sleep’s monitor design. Basically, in smart alarm mode, the monitor checks your sleep state and wakes you up in a more optimum time point when your body is on the border of the ready-to-wake up stage. Waking up at the right time means starting the day in a more refreshed and better mood. It is hard to understand why Nokia Health has not included a smart alarm system, as this is a standard feature of many of the sleep trackers in the market, and Withings Aura had this feature. Other products like Beddit or Sleepace Reston all provide this functionality. If you love the idea of not wearing anything to track your sleep, at $99, the price is not cheap, but also not expensive compared with other similar products. For example, both pad-based trackers Beddit and Sleepace RestOn Sleep Tracker come with a $150 price tag. If you don't mind wearing a fitness tracker while you are in bed and you want something cheaper, you may want to consider Letscom Fitness Tracker, which costs around $16 to $40. On a higher price range, you can check out two fitness trackers that monitor both your sleep and activity tracking, which are Fitbit Versa Smart Watch ($200) or Withings Steel HR Hybrid Smartwatch ($197). Nokia acquired Withings, a French health gadget maker, for $190M in 2016 to enter into digital health business to gain a strategic positioning in the health data industry, but it didn't go as expected. Nokia sold its health division back to Withings after a lot of negotiations with other potential buyers. After it was sold back to the founder of Withings, the new company has announced that they will continue to endorse and support all Nokia digital health products. Before the sell, in 2018, Nokia discontinued Aura sleep tracker, and instead replaced Aura with their new model, Nokia Sleep tracker. In short, what we call Nokia Sleep has now been re-branded as Withings Sleep Tracking Mat. Smart alarm is the significant missing feature of the Nokia Sleep. If it is an absolute must for you and you can't live without that, I recommend that you check out similar sleep monitors like Beddit 3 (now owned by Apple), which has this function. In my opinion, other than the smart alarm function, Nokia Sleep is a quality, solely sleep-oriented tracker device that does what it promises to do. You may need to play around to adjust and get accurate results at the initial set up, but mostly, it is a set-and-forget type of sleep tracker. You don't have to worry about charging it, and you don't need to wear something on your wrist every night. Even if Wi-Fi is gone for the night, it backs up the sleep data on its internal storage, and transmits it when Wi-Fi is back. Nokia/Withings Sleep is a solid product if you are looking for a hands-free dedicated sleep monitor and don't mind not having a smart alarm function.